Ryan Watkins was a double record holder at one point. Holding the record for the most catches by a Glamorgan outfielder and the record bowling figures in a T20 a few years back. Having retired from the first class game, Ryan is at the forefront of the Tom Maynard Trust and was an integral part of the famous cycle last year from Cardiff to The Oval. A top bloke, and a long term fan of us here at The Middle Stump, Ryan talks us through his mistake of slapping Simon Jones in the nets, Shane Warne’s incessant sledging and what makes a decent ice bath in the East Midlands. Read on to find out more in this hilarious interview with one of the games characters. TMS: You have been a massive fan of ours for a while now haven't you, it must be a privilege to be a part of such a classy publication? RW: Being asked to take part in this interview is right up there with the highlights of my career!! First class debut, first appearance at lords, man of the match Notts Cricket vs. Glamorgan Cricket at Notts Forest training ground, and now this!! All jokes aside I really enjoy what you guys do there and always look forward to a read of what you’ve been up to! TMS: What are you up to now? RW: Well my much better half is expecting our first born at the end of Feb so its all hands on deck with that at the moment! Time is flying by at the moment with it so it’ll be here before I know it, no doubt then the fun will start! I’m currently looking through my annual leave to arrange some time off as I’m hoping to get into a couple more cycle rides in 2013 for the Tom Maynard Trust too which no doubt I’ll need to get some training in for! TMS: You took part in the SWALEC to the Oval Cycle, was there the next Bradley Wiggins there? TMS: Who was the worst? TMS: Who is the biggest moaner in County cricket? Any bat throwers? RW: If Gareth Rees could turn up at the ground on the morning of a game, have some throw downs, a big breakfast, bat twice in the game and do absolutely nothing else at all he would be the happiest player. It may seem harsh but I genuinely think he has no interest other than batting! No fielding, no warm ups, no conversation with anyone else, he’s done!! He did throw a fantastic tantrum too, as the Leicester dressing room wall he put a hole in can testify!! David Hemp was classic for a rogue outburst but you never knew if he was serious or not, hence the nickname “Mad Dog” or “Scraps”. RW: Oooh, this could lose me a few mates this one. Right, i'm not saying hes lazy, but the big Cosgrove wasn't the biggest fan of the gym when he was over with us. We had a physio at the time who oversaw the training and him and because had one or two run ins over the summer. Ridiculous talent though, Australia could do worse than pick the big fella. RW: Too may to single one out at Glam, there was always some quality banter flying around the dressing room, usually directed at Gareth Rees again!! He does get a fair amount of stick on here from the lads but he’s a top lad really!! Former Middlesex keeper David Nash was always good for some banter as were a couple of other London lads, Rikki Clarke and a few others! There was a bloke who played at Derby, Tom Lungley, a complete muppet of a bloke who I have to give mention to as having the WORST chat in county cricket! RW: Shane Warne once sledged me every ball for a two hour session! We were on the receiving end of a tuning from Hampshire and I was just trying to delay the inevitable with Dean Cosker who was night-watchman. After an hour of constant barracking he decided that Dean as night-watchman was looking the far more accomplished of the two of us, and I had to agree!! I was a bit stumped for a comeback really, it’s Shane Warne. 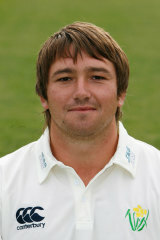 RW: Ok, going back many moons, Glamorgan were playing against Leicester at Grace Road. If I remember correctly Leicester got lots in the first inns and when it was our turn to bat we were undone by a well known overseas bowler who isn’t currently allowed to play the game due to not keeping feet behind white lines…Anyway, although a fantastic bowler, the player in question was not the most pleasant or complimentary individual to us friendly Glamorgan lads! At the end of each days play it was noticed by a few of our lads that said bowler enjoyed a cigarette and an ice bath in the shower room at Grace Road. Using one player as a lookout, one of our lads proceeded to add a little extra liquid to the ice bath by way of relieving himself just before the bowler sauntered in to enjoy his dip…proceeding to immerge himself completely in the ice bath, which now had a slight tinge of yellow about it….what is it they say about revenge being cold or something? TMS: Now as I foolishly 'liked' your Cricinfo page, many of my female fans now think I am you, as it comes up on my Facebook homepage. Who wouldn't you like to look like? RW: Are we talking in the cricket world or just in general? I don’t want to make any more enemies out there by dropping someone in that one! TMS: Best lookalike in cricket? TMS: Who is the fastest bowler you have faced, ever bricked it facing anyone? RW: Ooohh, tricky one that!! Stuart Meaker was quick at the oval and I’ve got to say, Kirbs bowled some quick spells against me over the years but I think the quickest would have to be Glammy’s very own, “The Racehorse” Simon Jones! Going back a few years he was proper rapid and I made the mistake of whacking his slower ball in the stands in nets one day! Well he just gave me a look that made me think “what have you done!? !” and I genuinely don’t think I saw anything else he bowled at me during that spell. TMS: Are you still playing? I hear the South Wales league has more money than the IPL? RW: Twice as much for some of the boys, no names mentioned!! I’m still having a go, I’m playing for Newbridge Cricket Club in the Glamorgan and Monmouthshire Division 2 and although I only played 5 or 6 games due to work last year I enjoyed every minute of it!! We’ve got a great bunch of lads down there and although we take it seriously on the field it’s a great social atmosphere down there and somewhere I really enjoy being part of things. Travel Expenses in the South Wales League? TMS: Who is the best player to have never played County cricket? RW: When I first joined the staff at Glam there was a lad there the same time as me called Lloyd Smith form Penarth. Lloyd had a few years on a summer contract and was a fantastic player who had all the talent and ability in the world, still is a very good player now as he got a hundred in a t20 game against glam last year! He was one who I thought would have gone a long, long way. A lot of people say he wasn’t given the chances he deserved and I agree with that too, but Lloyd is a great lad and now owns half of Penarth and Cardiff I think! TMS: Finally, what are you up to next? RW: Currently trying to locate the whereabouts of my new Specialized Road bike that was due on the 19th December! I’m getting a fair bit of stick from the Castleton Chargers, the cycling club that a few of the Glammy boys have formed along with a few others such as Glamorgan T20 record holder Ian Thomas and the welsh version of Jerry Maguire Ian Bird! There are a few cycling events coming up in the summer all in support of the TMT which I’m really keen to take part in and try and promote the trust as much as possible as its so close to the heart. So if anyone knows where my bike is, please feel free to let me know! Nice stuff. One day no doubt far into the distance I'll try and do an interview with a player too I think (not trying to stomp on your patch here!). It defo involves effort and some form of human contact/conversation though, so I'll see how that goes! Enjoyed the tale about the ice bath!